We can accommodate groups of 10 to 300 passengers on most of our scheduled voyages. Many vessels within Our Fleet can be chartered for voyages of various lengths and with itineraries of your choosing, so you and your family, friends, alumni group, club and/or business associates can enjoy a truly unique sailing experience. 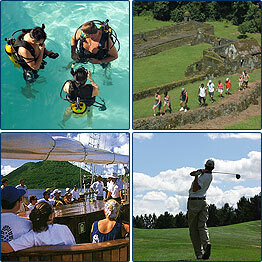 We can also customize a voyage's activities or menu to match your group's size, budget or interests. Many vessel operators also offer group rates and discounts for groups of large enough size. Call us at 1-877-882-4395 for more information or to arrange for a group or chartered voyage. Many vessel operators design certain voyages to appeal to groups of people with common interests such as those listed below. These sailing vacations can be booked by anyone, but space usually goes fast, so call for more information or to book passage. Voyages that coincide with or follow the course of a tall ship race or regatta.